"Artsy Hotel & Guest House"
The concept of Artsy Hotel & Guest House is an extra charm of the hotel; the atmosphere breathes art and our guests can take advantage of the artistic climate of this movie village to watch the rare films from our video library, read a selection of handpicked books, enjoy the illustrations and graffiti created especially for the home, and discover the best tips of Rio offering a good wine or that cold handmade beer in the company of other guests or the hosts themselves. Casanova Residence, offers a range of special packages to meet couples on special occasions, groups looking for authentic experiences and varied productions. Enchanted yourself with a view in your special day, enjoy the ambient and take amazing pictures. 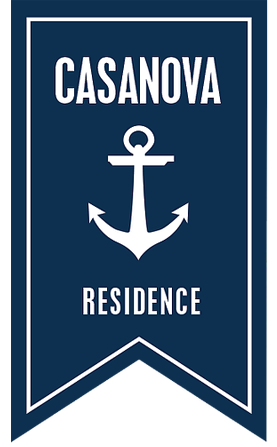 The Casanova Residence is the perfect place to enjoy memorable moments for two. Are you getting married on the island of Gigoia? How about a wedding night at the most charming place on the Island? At the Casanova Residence you find all infrastructure to realize projects of all kind. "It was there that I made the request for marriage to my fiancee, and I was sure that this magical moment (for that was what Felipe and Mari transformed) had to be lived there. From the first phone call I saw that it was something different, and had high expectations, but when I got to the place, I saw the room, I talked to the host ... Ours, my expectation was easily overcome. In addition to being a beautiful place, it seems like a movie scenario and you completely forget that you are in the middle of the city, the treatment received is off the curve, the whole staff is to be congratulated, I will never forget this incredible lodging, which undoubtedly was the best of my life! Thanks y'all!" Charming suite, beautifully decorated with a beautiful view of the Lagoon. The Ilha da Gigoia is very well located, close to the beach and next to the subway. A trip to keep with fondness in memory. Thank you, Casanova Residence. The views and bars on the island are memorable. "Nice place and easy access. Exceeded expectations, great reception, attentive and helpful managers. I loved the package I hired, Romeo and Juliet, everything was flawless!" "Incredible place, beautiful decor, everyone very responsive and polite. The best option on the island." "Cleaning, room, view, site organization, price, loved everything!" "The location is great. Loved the decor, the bed is super comfy and the breakfast was great." "The service was great. The owners were very attentive. The view from the suite is very beautiful. The suite is comfortable!" Check in: 13:00 Check-Out : 12:00. Alameda das Mangueiras, casa 1, Beco das Artes, Ilha da Gigóia, Barra da Tijuca - Rio de Janeiro. With privacy and concern for your stay is the best possible! More info here. Designed with by Artaxnet Soluções Hoteleiras · Photos & Icons by Casanova Residence & Artaxnet Soluções Hoteleiras.